WARANGAL DIST - 506 151 16 484 WARANGAL INSTITUTE of TECHNOLOGY & SCIENCE, Gudepadu - Parakal Road, Oorugonda (V) Athmakur Tashil ,WARANGAL - 506 342. RANGA REDDY DIST, -509 217. RANGA REDDY DIST-- 501 301. 38 266 JAYA PRAKASH NARAYANA COLLEGE OF ENGG. 39 266 JAYA PRAKASH NARAYANA COLLEGE OF ENGG. 40 266 JAYA PRAKASH NARAYANA COLLEGE OF ENGG. 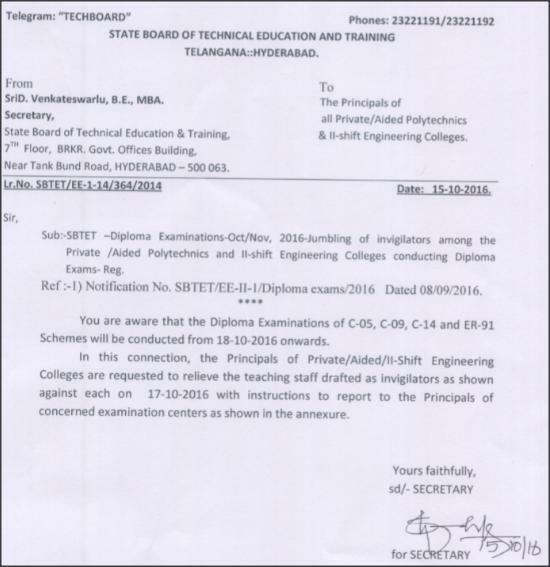 MAHABUBNAGAR DIST 8 266 JAYA PRAKASH NARAYANA COLLEGE OF ENGG. KARIMNAGAR DIST - 505481 8 488 TRINITY COLLEGE of ENGINEERING&TECHNOLOGY,KARIMNAGAR-505001. Sy.No.773, Chatanpally Village, Farooqnagar, Shadnagar, MAHABUBNAGAR DIST.-509216, 8 266 JAYA PRAKASH NARAYANA COLLEGE OF ENGG. RANGA REDDY DIST- 501510 8 508 SUPRABHATH COLLEGE of ENGG & TECHNOLOGY, Sy.No.1237,Sheriguda, Ibrahimpatnam Mandal, RANGA REDDY Dist. - 501 510. MAHABUBNAGAR DIST- 509 204 8 266 JAYA PRAKASH NARAYANA COLLEGE OF ENGG.